Casual doesn't mean dressed-down. It means comfort that feels fabulous and makes your living room a welcoming place for you and your family. The Shoal Creek chair and ottoman provides just that, the plush comfort and sophisticated, traditional look you desire. Cushions filled with duck down and blended polyester fiber softly hug your form as you relax. 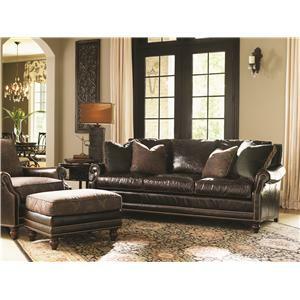 Dressing up this comfortable set are traditional rolled arms, and nailhead studs along the arm and back border. 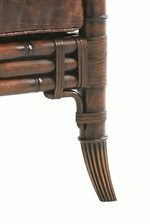 Elegant turned wood legs complete the look. 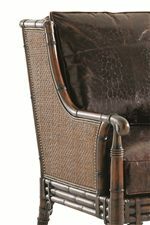 The Landara Shoal Creek Chair and Ottoman Set by Tommy Bahama Home at Hudson's Furniture in the Tampa, St Petersburg, Orlando, Ormond Beach & Sarasota Florida area. Product availability may vary. Contact us for the most current availability on this product. 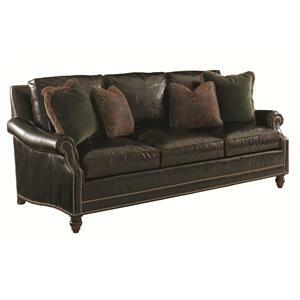 LL7722-44 Shoal Creek Ottoman 1 28.5" 21.5" 19"
LL7722-11 Shoal Creek Chair 1 38" 40.5" 36"